You don’t need a degree in finance to invest in real estate (though it helps). There are key metrics that you should know about every possible real estate deal that you’re looking at, and this book Frank Gallinelli gives you all the tools you need to crunch the numbers on opportunities so you can put your money to its best use, as well as make the mistake of doing the wrong deal. Even if you are a beginner to real estate, this book lays out all the key financial metrics that should be considered for any real estate deal into easy to understand terms so you can correctly assess the value of a property and ensure it brings you financial returns. 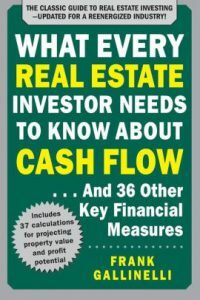 Regardless of whether you are a beginner in real estate or a seasoned veteran, this book has become a staple among real estate investors to help make the important calculations that determine whether or not a deal is worthy of your investment or not. Real estate can be a phenomenal investment when you crunch the numbers and make the right deal. However, if you just blindly throw your money at a property, it can be a money-pit. In terms of books about real estate, this is the best I’ve found that breaks down the math in an easy-to-digest fashion that all levels, with perseverance, can master. Frank Gallinelli teaches real estate investment analysis at Columbia University’s Master of Science in Real Estate Development program. He is also the founder and President of RealData, Inc., one of the leading investment software firms in the real estate industry. I’m going to be very blunt here- the man is brilliant. He’s no joke, he teaches graduate school at Columbia University. […] After reading so many books without any real substance this will absolutely be the go-to book “MUST HAVE BOOK”. I learned a lot from this about how to analyze a deal and how to manage a property from a financial/quantitative perspective which helps pull the emotion out and make real returns. Anyway, mission accomplished on this book; I’ve gotten the financial models I need. This is an amazing tool and a must-read for anyone who wants to get serious about knowing Real Estate finance and cash flow.